A woman enjoys the serenity of canoeing on Rock Lake in Algonquin Provincial Park in Ontario, Canada as the sunset sparkles off the Autumn colored trees. 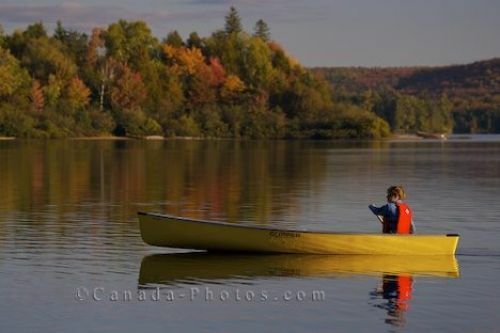 Amongst the glorious Autumn colors that surround Rock Lake in Algonquin Provincial Park in Ontario, Canada, a woman takes her canoe out for a calming afternoon trip. The lake is peaceful and the trees are beautiful as they reflect their stunning colors on the surface of the lake and days like these make canoeing a paradise. Picture of a woman canoeing on Rock Lake in Ontario, Canada as the sunset takes over the area on a beautiful Autumn day.